November 2012 – Comedy or Tragedy? Sorry for the vast, echoing silences around here lately. I finally kicked the bronchitis, emerged from my cocoon of misery, and discovered I was so behind on my work that there was nothing to do but take a deep breath and dive headfirst into the deep end. Three more weeks stand between me and the end of the semester. I’ve got quizzes, a stack of research papers, a late midterm, and two finals to deal with between now and then. My reward at the end of the tunnel? Eggnog. Lots and lots. Homemade. With bourbon. Hasta la pasta, folks! I’ll see you later. This recipe is my traditional Thanksgiving dessert, but it would make an equally good finish to any meal of note during the holiday season. When you cook it, you think of roaring fires and big glasses of aged liquor and regrets about notches on your belt. And the house smells of sugar, butter, and bourbon for hours. And you tell yourself it’s not so bad because at least it’s got nuts in it, and nuts are good for you, aren’t they? Another plus to this pecan pie is that it takes a rather long time, but good chunks of that long time are “waiting time” — or, as I like to call them here on Comedy or Tragedy, “writing time”. Sift together the flour, sugar, and salt. Add the cubed butter and rub together with your fingertips until the dough becomes moist and takes on the consistency of small, soft peas. Add the water a little bit at a time, mixing with a fork. The dough will be very sticky. Mold and kneed it together into a ball, working it until the butter and flour are well incorporated. Press the dough into a disk and wrap it in saran wrap. Refrigerate for 30-45 minutes. While you’re waiting for the dough to firm up in the fridge, pull out your laptop and get writing. Do a sprint and see how many words you can net in 30 minutes. After 30 minutes, take the dough out of the fridge. If it is still too soft, put it back in for another 15 minutes or so. When it’s firm, using a rolling pin, roll it out on a floured surface (tip: because this dough is very heavy in butter, and therefore rather sticky, I like to roll it out on a layer of plastic wrap, for easy transport into the pie pan). Roll the dough to a thickness of no more than 1/8 of an inch. Place the rolled crust into a pie pan and crimp the edges (leave a high edge, as the crust will shrink as you bake it). Put the entire pie shell in the freezer for another 30 minutes. …and there you go – another 30 minute writing sprint. Go! In a saucepan, mix all the butter, all the sugars, the corn syrup, the milk, the flour, the vanilla bean (and scraped seeds) and the salt together over medium heat. Keep stirring until the mixture just comes to a boil. Turn off the heat and let the mixture sit for 5 minutes. Carefully add the bourbon (mixture may bubble – stir carefully). As the sugar mixture is cooling, beat the eggs in a heat proof bowl. Carefully (gradually) add the hot sugar mixture to the eggs, whisking constantly. Fish out the vanilla bean and discard it. 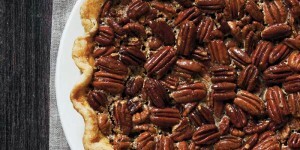 Once the pie crust is out of the oven, layer the toasted pecans on the bottom of the shell. Then pour the filling over the nuts. You may have excess filling. Bake the pie at 350 degrees for about 40 minutes, or until the filling is just set. While the pie is baking, return to your laptop and write, write, write. If the insanely good smells filling the house aren’t inspiration enough, I don’t know what is. Once the pie is done, let it cool on a rack. Leave the pie covered with foil at room temperature until serving (can be made 1 day ahead of time). Whip up some fresh cream (maybe with a bit of sugar and a splash of bourbon) for serving. Oh, and prepare a new notch on your belt buckle. Bon appetit, and happy writing! I no longer know what to do with all these damn lemons! I’ve made lemonade. I’ve put them in my tea. I’ve preserved them, and pickled them, and grilled them, and dried them. I’m all lemoned out. This has been, hands down, one of the worst stretches of bad luck I’ve had in a long while. I’ve now been sick for a month – one nasty cold virus after another. Coughing, hacking, phlemy misery. I dragged my sorry behind in to school to teach classes on Thursday and paid the price. Two whole days with no voice whatsoever. My fever came back. I had to cancel my trip to San Francisco, where I was supposed to present a paper at the American Anthropological Association and meet up with one of my best and oldest friends. I am, without doubt, feeling very sorry for myself. A few upshots, though. My foggy head has cleared enough the last few days that I’ve been able to tackle a little writing. I’m making some progress on my revisions to ABSENT and have also resuscitated an old novelette about post-apocalyptic treasure hunters — sort of Indian Jones meets Tomb Raider meets Firefly. That’s been fun. While Sid and I are both suffering (he’s been ill too), Mr. Ramses is in heaven. He’s delighted that someone other than himself seems to want to spend all their time in bed. He’s been a fat, snuggly companion while I recuperate. Sad to say, but that’s all the news from here. Sick. Minimal (but improving) writing progress. Happy cat.